Since lately it has been pretty cold here in Dallas, we decided to get out of the cold and rain for a different type of indoor event — neon bowling! What is more fun than bowling in crazy colors with your friends and eating pizza for an entertaining Saturday evening. Bowling is a great opportunity for new and existing members to meet up, have a blast, and maybe even meet someone they make a special connection with. We had a great group of 40 people for this event, evenly split among women and men and divided up over eight lanes. In fact, we had one whole end of the alley all to ourselves! Members arrived early and got their fantastically designed bowling shoes, giving them a chance to mingle before our lanes were ready and the pizza and sodas arrived. Before we split up the group across our eight lanes, the pizza made its appearance and was gone in no time. Then it was time for the action. You could hear everyone cheering each other on when it was their turn to bowl. There was both some fun and some slightly serious competition between the bowlers at our lane and the bowlers at other lanes in our group. We were all having such an amazing time bowling and mingling and getting to know the new members that were here for their very first event. It made for a great mid-month event for the beginning of the year! You could definitely tell that Events & Adventures Dallas was making its presence known at the bowling alley that evening. One of the many things I love about Events & Adventures is the chance to go outside my comfort zone without having to put in too much effort to accomplish it. We just went indoor skydiving. I don’t think I’d ever do that on my own. It sounded cool, but would I really do it? Would it be too hard? With so many other members of Events & Adventures Dallas taking part in the event, I got up the courage to try it. Everyone was excited; some of us were nervous but others were super-pumped to give it a shot! We had our private flying class and learned how to do it safely while having fun. The jokes in the room made us all more comfortable. We geared up, and journeyed into the tunnel to wait our turn. I loved that everyone cheered for each other. Watching others cemented in my mind that I can do this! We had someone taking photos outside the tunnel and I saw everyone smiling and hamming it up for the camera. Watching was almost as fun as flying. My favorite to watch was a member with brown braided pigtails with blue in them. They looked like they had their own flight plans! I Found a New Comfort Zone — Floating in the Air! When it was my turn, I fell into the air and felt it catch me and hold me up before the instructor directed me to the middle of the tunnel. I was there for one minute—but it felt like 10. He gave me directions to improve the experience: legs straighter, arms lower, legs more bent, hands together, and relax. It was hard, but exhilarating. As I stepped out of the wind tunnel into the seating area everyone clapped and told me how great I’d done. Then, we all got to do it a SECOND time! Some of our group had the ‘high flyer’ option and the instructor took them up towards the top of the tunnel. I chickened out, but the ones that did it loved it. When we all exited the wind tunnel area we had a great time talking about how we felt, how each other did and how everyone wants to do it again. The comradery was the best part. I can actually enjoy getting out of my comfort zone while having other members there to support me. It’s great to feel welcome and supported by so many people that I hardly know. I plan on getting to know them all better! No other singles club provides that kind of feeling of community like Events & Adventures! 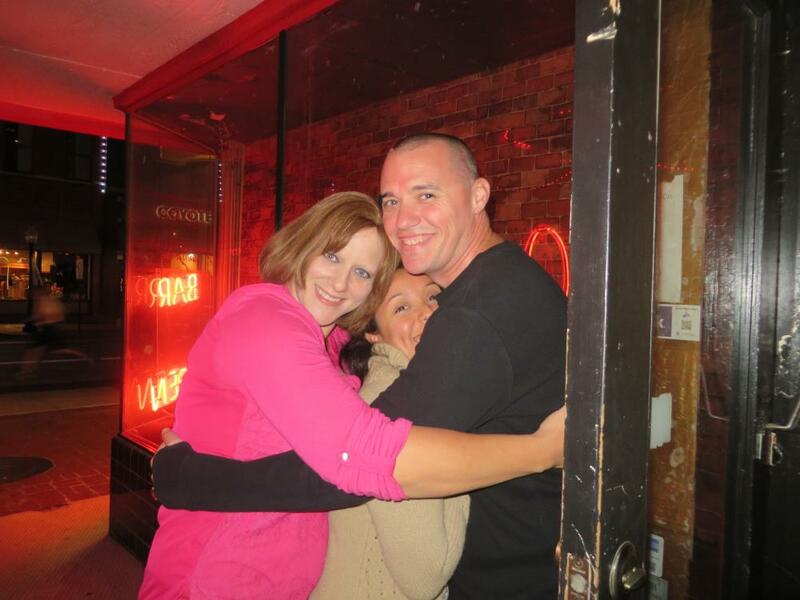 Events and Adventures Dallas Singles Poker Crawl! A poker run on a motorcycle has 5 stops where everyone gets a card to make a poker hand. A pub crawl is on foot and hits several bars. 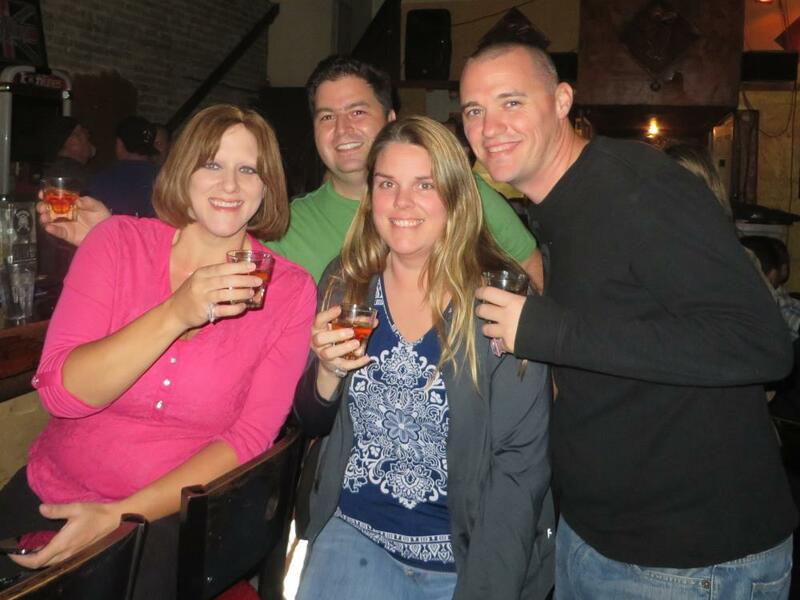 Mix them together with a group of singles and you get an Events and Adventures poker crawl! We don’t have as many people with motorcycles as with feet, so we hit Sundance Square on Saturday night. We were ready to play a game of poker and check out some of the local pubs. We started with appetizers and our first card. You really have no idea how things are going to until the third card. Then you know if you are in it or just there for the pub crawl the rest of the night. We hit some really cool places. Really nice and even a dive bar. How many people can you fit in an elevator? By our 5th stop everyone was impatient to get their card to see if they could make a hand or draw. Whew! So we all know most people cheat and trade cards right? Hmmm . .Who has the worst hand? The best hand? High card draw wins! Congrats Tanya, your very first event and you won! Events and Adventures Dallas Tackles Lil Ninjas Obstacle Course! We checked out Lil Ninjas obstacle course and dodgeball Saturday night. This place was technically built for kids, but it was a blast! Some of the more advanced elements of this obstacle course were hard- and impossible for many! We were the guinea pigs for glow in the dark dodgeball. Those balls never seem to stay glowing so they are changing it to black light. We wore glow necklaces and laughed about the walls attacking us when we were certain weren’t anywhere near them. A few of us made it across the unstable ladder. I was surprised I was the first! Gotta be smarter than the ropes. J The curved wall was a dream for most but a few made it up there! Since it was just us and not open to kids we were allowed us to bring beverages of intellect which made everything even funnier. Those that didn’t want to play just came and cheered and jeered those that accepted the challenge. It was a great change from the weekend bar scene. Don’t get me wrong, I love the dancing and parties we have but it was something new, unusual and totally fun! He Pops The Question…..Another Happy Couple! I love these kinds of stories! Will joined E&A last February. On our Cinco de Mayo dinner cruise Marcia brought her friend Lenea as a guest. Will and Linda immediately hit it off. Lenea joined the group shortly thereafter and she and Will have been inseparable. They are even joining us on the New York trip this week! A little bird told me this trip was going to be something to remember forever and Lenea’s smile said it all. A formal engagement was coming. Well, that little bird wanted there to be a surprise for Lenea. This past Saturday Will and Lenea had a few friends over for a wine party. I was one of the lucky guests. When Will was thanking everyone for coming he dropped to one knee, whipped out a beautiful ring and asked Lenea to marry him. She of course said Yes! Congrats you two! We look forward to your nuptials next fall! We Do The Coolest Things! Last week an indoor skydiving facility opened here in DFW. There’s only a dozen around the world so we were thrilled to try it out. It’s the floating sensation like the free fall in skydiving, but it’s only a few feet off the ground and there’s a guy standing there making sure you are floating right and having a blast. The whole surface area and wind speed physics thing is amazing. A guy stands next to you while you are floating on air! They adjust the air speed for each person’s weight and skill level. We got to watch experienced jumpers and they do all kinds of tricks and spins. I had the best time! We had a few hesitant members come watch instead of jump and they are all going to try it next time. It’s not at all scary like jumping out of a plane. It’s awesome! After we grabbed lunch and we dished on how we felt we and the tricks we want to learn when we do it again. I am definitely hooked on indoor skydiving. This Was My First Event! Less than 24 hours ago, I attended my first Events and Adventures activity. Cross it off the Bucket List….Skydiving! The E&A Skydive was amazing! The 60 second free-fall full of spins and twists rivals no other thrill! I even got to pull the rip cord for my chute … What a ride! Then gently float to the earth below with a few more spins … and the perfect landing … awesome hardly describes it!